When traveling in Denmark from Copenhagen to Aarhus (and from Aarhus to Copenhagen), travelers have a good selection of different transportation options. However, each option has its own pros and cons. Find out here which fits best for your trip from Copenhagen to Aarhus. Here are the five transportation options to consider. Flying between Copenhagen and Aarhus only takes about 45 minutes and there are several direct flights daily, offered by SAS and others. This is a good option mainly for travelers pressed for time. Otherwise, the disadvantages are the price tag and that there's not much to look at during the trip. Taking the train from Copenhagen to Stockholm usually costs a little less than plane tickets and is a good option if you want to stay flexible. 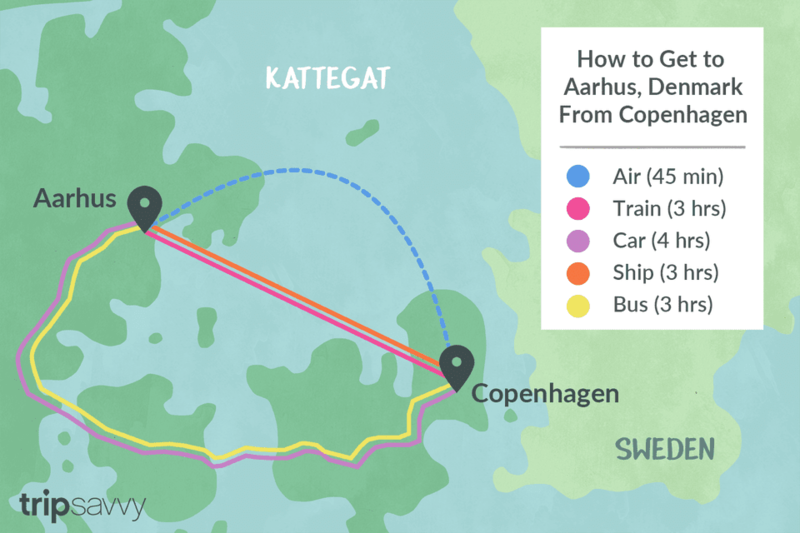 It also takes longer (about three hours) to travel between Copenhagen and Aarhus, though. Trains leave either city every 30 to 45 minutes and the train ride is scenic and relaxing. You can get flexible train tickets and compare prices at RailEurope.com. Driving between Copenhagen and Aarhus is suitable if you have about four hours of time for the 300 kilometers (185 miles) distance, a rental car and are ready for a scenic drive. There are two routes you can take: The easy option includes a toll road and the bridge across Storebælt (DKK 200-330). To use a ferry between Copenhagen and Aarhus, take a look at the second driving option above. This is a viable option that leaves travelers flexible, relaxed and with money to spare. The Abildskou bus line 888 connects Copenhagen and Aarhus daily. It's comparatively inexpensive for an adult bus ticket, paid directly to the bus driver. The Copenhagen-Aarhus trip takes about three hours. How Do You Get from Copenhagen to Oslo?